Recording smart phone video selfies of tooth brushing can help people learn to improve their oral health care techniques, according to a study don at Case Western Reserve University School of Dental Medicine in Cleveland. The research was published in the Indian Journal of Dental Research in August 2016. A release from CWRU explains that study participants used smart phones propped on stands in order to film their brushing at home. The researchers saw an increase in the accuracy of brush strokes, an increase in number of strokes, and an overall eight percent improvement in tooth-brushing skill–but the length of time a person brushed did not change. While most people have the ability, motivation, and desire to brush their teeth properly, they often do not because of improper techniques–and opportunities to improve such skills can be few. The release quotes Lance T. Vernon, a senior instructor at the Case Western Reserve University School of Dental Medicine and co-author of the study, as saying, “Often, tooth-brushing is learned and practiced without proper supervision. Changing tooth brushing behaviors–which are ingrained habits tied to muscle memory–can take a lot of time and guidance. The very act of recording a selfie may disrupt ingrained habits, making participants conscious of their brushing and reinforced staples of behavior change, including the process of memory formation, association, and creating new muscle memory. While the results of this small pilot study are promising, the researchers suggest that these findings are of more importance in proving the selfie concept is useful in a dental setting. Video and picture selfies are increasingly used in medical fields to assess, monitor, and determine the progression of diseases and effectiveness of treatment — a new area of gathering data known as mobile health, or “mHealth”–said Vernon. Before the study, participants’ brushing habits were assessed and corrected until each were able to demonstrate proper technique. During the study, they were scored on time spent brushing and skill mastery, including brushing in a circular motion, obtaining a 45-degree angle while brushing facial surfaces of teeth and correct positioning of the arm. Looking ahead, researchers envision a video-based monitoring app, which could record videos of patients brushing at home that are later reviewed by oral health professionals. 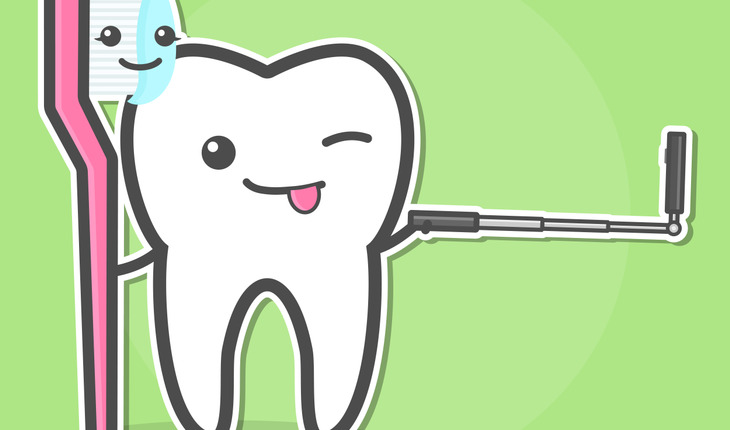 Tooth brushing helps avert preventable oral diseases, such as tooth decay and periodontal disease, although its effectiveness depends on brushing technique; currently, there is no standard brushing technique consistently recommended by dental organizations or even by oral health experts, Vernon said. The study was co-authored by Rooban Thavarajah, professor of oral and maxillofacial pathology/ microbiology at Ragas Dental College & Hospital in Chennai, India; Arunachalam Mohandoss Anusa, an assistant professor of psychiatry at Shri Sathya Sai Medical College and Research Institute in Nellikuppam, India; and Theodore Walls, an associate professor at and co-director of Center for Health Monitoring and Intervention Behavioral Science in Kingston, RI.